Jasper National Park is the world’s second largest Dark Sky Preserve (DSP), and as such is one of the best places, not only in Alberta, but in western Canada for astronomers to observe the night sky. To celebrate this fact, the Jasper Dark Sky Festival, taking place October 18th to 27th 2019, will see astronomy experts and amateur star gazers descend upon Jasper Alberta for a weekend of workshops, scientific demonstrations, entertaining presentations, and of course as pristine a night sky as an astronomer could hope for. October can be a great month for visiting Jasper, with the town and surrounding area being much quieter than during the busy summer season, meaning that some very attractive room rates can be found. To check rates for several hotels at one time, click here and enter your travel dates. *The event schedule for 2019 is still to be finalized. In the meantime, you can whet your appetites with the following itinerary from the 2017 festival. Day one of the festival features one of the most unique experiences of the entire program with the Columbia Icefield Stargazing Tour. You will be collected from Jasper and taken to the Columbia Icefield on the Icefields Parkway where a sunset Ice Explorer journey along with canapes on the Athabasca Glacier awaits. After a dinner buffet at Altitude Restaurant astronomers from the Royal Astronomical Society of Canada will help you interpret the night sky from the unrivalled viewpoint on the Glacier Skywalk. This tour departs Jasper at 3.30pm on October 13 and 14 2017 and costs $175 for adults and $109 for children. Also on the opening evening of the Jasper Dark Sky Festival is a rare opportunity to see jazz legends Tommy Banks and PJ Perry performing live at the Fairmont Jasper Park Lodge from 7pm on October 13 2017. Tickets, costing $94.82, include admission to the concert plus a stand up reception with food stations and two glasses of wine. Of the many locations to view the dark skies in Jasper National Park, few can get you as close to the stars as the Jasper Skytram. On the evenings of October 13 and 14 their Skytram Flight and Star Gazing Experience will take you almost 1km above the valley to a lookout where you will be able to look through powerful telescopes while experts from The Jasper Planetarium will be on hand to teach you about the night sky. Packages start at $84.95 per person. On the afternoon of Saturday October 14 starting at 2pm the Planetarium Dome Experience is a great way to learn about Jasper’s dark sky preserve with the opportunity to ask your own questions inside the Planetarium dome theatre located at Marmot Lodge ($29). At 3pm the same day there is a solar tour in the Jasper Planetarium, showing you the wonders of the daytime sky ($39). On the evening of October 14th, Symphony Under the Stars is a unique opportunity to see an outdoor performance by Edmonton Symphony Orchestra under pristine night skies, accompanied by a gourmet dining experience at the Fairmont Jasper Park Lodge. Also on October 14 from 9pm, the Jasper Dark Sky Experience is a free event at Marmot Meadows where you can learn more about the benefits of dark skies both to people and wildlife, while taking in the pristine night sky. On Sunday October 15 there’s an opportunity to enjoy Stargazing at Maligne Canyon. Astronomy author Peter McMahon will be joined by experts from Jasper Planetarium to help you get the most from this unique site plus you’ll have a tour of the biggest and most powerful telescopes in the Rockies. This event takes place from 9.35pm and costs $89 including transport. The main event on the evenings of Friday October 20 and Saturday October 21 is the Keynote by space scientists Brian Cox and Phil Plait. During this 90 minute presentation some of the universe’s unanswered questions will be discussed, as well as impressive discoveries revealed, with the opportunity to pose your own questions in the Q & A. Preceding the Keynote, an expert panel including Rob Thacker, John Rennie, and Natalie Panekwill will present Spacetalks, a discussion of the present and future of space exploration. The package price for both presentation is $140, while tickets for just Spacetalks can be bought for $55, starting at 7pm on Oct 20 and 7.30pm Oct 21 at Centennial Park. On October 20-21 at the Sawridge Inn there is a Night Photography workshop which will cover tips and techniques for photographing the night sky. Taking place over 2 consecutive afternoons and late nights, and run by Canadian Photo Adventures the workshop costs $349 per person. Big Bang Expo is a free daytime event where scientific demonstrations, experiments, robotics and brain teasers will be presented by Telus World of Science Edmonton on October 21 from 9am to 1pm at Jasper Elementary School. They will also be bringing an inflatable planetarium where various family friendly shows will be presented from 10am to 3pm. For some free stargazing in downtown Jasper with professional astronomers from the RASC, come along to the Visitor Information Centre Lawn from 8.30-10.30pm on October 21. 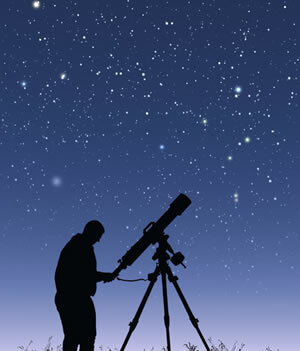 Here you will get a chance to gaze into the heavens using powerful telescopes, or bring your own and get some tips on how to use it! For further information about special events taking place during the 2019 Dark Sky Festival, and to buy tickets, click here.